Panama City, Panama: The third edition of the Global Business Forum (GBF) on Latin America concluded today in Panama City with a call from government and business leaders to capitalise on new trade and investment opportunities that are emerging in the Latin America and Caribbean (LAC) and GCC regions. Held under the theme “Next Hubs, New Regions”, the two-day forum featured 17 sessions and 46 speakers. Among the high-level attendees and speakers were H.E. Juan Carlos Varela, President of Panama; H.E. Jovenel Moise, President of Haiti; H.E Isabel de Saint Malo, Panama’s Vice President and Minister of Foreign Affairs; HE Eng. Mohammed Ahmed Bin Abdul Aziz Al Shehhi is Undersecretary for Economic Affairs at the UAE Ministry of Economy; H.E. Majid Saif Al Ghurair, Chairman of Dubai Chamber of Commerce and Industry (Dubai Chamber); H.E. Hamad Buamim, President & CEO of Dubai Chamber, in addition to several ministers, top government officials and business leaders from the UAE, Panamá, Haiti, USA, Brazil, Argentina, Colombia, México, Uruguay, Jamaica, Dominican Republic, Honduras, Ecuador and Paraguay. important role in facilitating trade and creating prosperity in their respective regions. The Panamanian President revealed plans for the two countries to establish specialised working groups that will aim to foster bilateral cooperation in key sectors of mutual interest, including tourism, real state, free zones, among others, to achieve short term results and boost bilateral relations. He called on Panamanian’s public and private sector players to participate in Expo 2020 Dubai which he described as an ideal opportunity for Panama to showcase the potential it can offer the world. H.E. Varela added that Panama offers competitive advantages that companies in the UAE and GCC can benefit from such as its growing investment opportunities, sound financial infrastructure, added value provided by an established logistics sector, and strategic geographic position providing easy access to the Caribbean and Latin American markets. H.E. 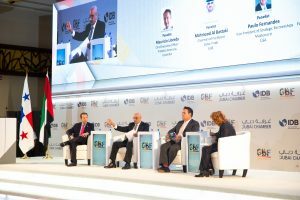 Moïse stated that Haiti is focused on developing its infrastructure, improving connectivity, and investing in several sectors, such as agriculture, renewable energy and healthcare, adding that these are all areas where it is looking to expand its cooperation with the UAE and other countries. For her part, H.E. de Saint Malo elaborated on Panama’s strengthening position as a trade hub and noted that businesses in other countries can benefit by leveraging this position to do business in the LAC region. She revealed plans for Panama to adopt a new framework to support sustainable development and shift the country towards a fully bilingual system, adding that these efforts would enhance the attractiveness of the Panama market to foreign companies and investors. Participating in a panel on entrepreneurship and innovation, H.E. Hisham Al Shirawi, 2nd Vice Chairman of Dubai Chamber stressed the importance of strong government support in order to develop and nurture a thriving startup eco-system. He described Dubai as a leading example in this regard as the emirate’s public sector has invested in harnessing the potential of startups which remain an importance source of innovation. He noted that Dubai’s startup community is developing new concepts that utilise advanced technologies such as blockchain, artificial intelligence, Internet of Things, smart city solutions and 3D printing, and said this trend is also gaining momentum in Latin America, adding that startups in both regions can benefit by sharing knowledge and boosting cooperation. Ahmed Bin Sulayem, Executive Chairman, Dubai Multi Commodities Centre (DMCC), said DMCC is focusing its efforts on promoting Dubai’s logistics strengths and competitive advantages, and encouraging companies to come to the emirate. He noted that this approach has made DMCC the largest free zone in the UAE, adding that it is now aiming for 30,000 member companies by 2025. IDB released a new report during the first day of the forum in cooperation with Dubai Chamber which shed light on trade flows between LAC and GCC markets, and examined the potential for boosting bilateral trade in the future. The report noted that trade flows between Gulf countries and Latin America and the Caribbean could grow by $13 billion per year, should a series of recommendations be adopted by countries in both regions, namely the signing more trade and investment deals and opening more diplomatic and trade promotion offices, increasing the number of diplomatic missions; establishing additional direct flights, and expanding bilateral business exchange. Addressing delegates on the second day of the forum, Mahmood Al Bastaki, Chairman of the Board, Dubai Trade, UAE shared his views on the synergies and strengths shared by Dubai and Panamá as strategic logistics hubs for their respective regions. “We see a lot of companies moving their headquarters of logistics to Dubai. They consider many factors: fast processing, visibility, infrastructure, tolerance, stability and safety. We are seeing this is also happening in Panama, companies are moving their operations and headquarters here for the same reasons,” said Al Bastaki. Speaking on the topic of food security, H.E. Essa Abdulla Al Ghurair, Founder and Chairman, EGI, said the UAE is utilising new technologies to grow food products locally and diversifying food manufacturing practices to reduce its reliance on other countries. He noted that new partnerships have been established between UAE and Latin American companies to grow and distribute food products, and improve logistics processes needed to transport food between the two regions. Boosting connectivity and offering high-potential products are steps that can be taken to further expand bilateral cooperation in this area, he said. strategies for success in the logistics of a global hub, connectivity being the key to really boost commerce between the two regions. 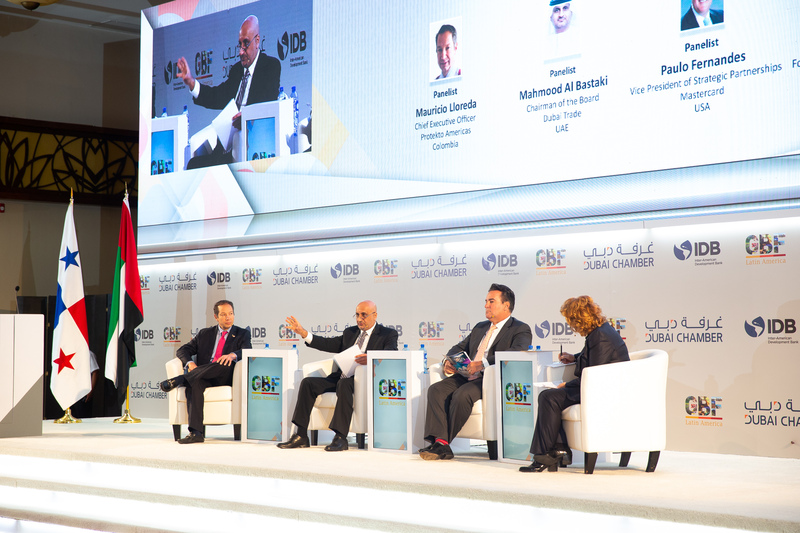 The Global Business Forum (GBF) series was initiated in 2013 as part of Dubai Chamber’s strategy of international expansion, to position Dubai as the gateway to the world. 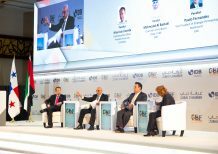 The previous two editions of GBF Latin America were hosted in Dubai in 2016 and 2018, followed by the third edition in Panama in 2019. During the forum in Panama, Dubai Chamber announced its plans to open a fourth Latin American representative office in Mexico. The Chamber currently operates three offices in Argentina, Panama and Brazil which focus their efforts on promoting Dubai as attractive business hub and identifying business opportunities in these markets which offer the most potential to its members.